Power and its Minions: Is Salmond Up To It? Compare if you will the Ireland of 1798 to that of 1920. Or the India of 1857 with 1947. The rebellions on the earlier dates (1798 & 1857) were doomed to fail, taking on a British Empire at the peak of its power. The latter dates (1920 & 1947) were the culminations of successfully orchestrated struggles, using concerted colony-wide campaigns of obstruction and resistance to disable Britain’s ability to rule each region. Both colonies were ultimately successful at gaining independence, although by very different means. Both of Ireland’s rebellions were violent. In contrast, after the suppression of the 1857 rebellion, Indians realised they could not leave the Empire by force of arms and eventually adopted Gandhi’s policy of non-violent resistance. In contrast, the successful twentieth century rebellions were both begun while Britain was engaged in fights for its very existence. This is again the case today. Britain is now undergoing the worst financial disaster in its history. Its self-appointed political super-class has managed to mire the pseudo-state in unprecedented and almost unimaginable levels of debt. Its banking system is falling apart at the seams with a run expected on sterling, hyperinflation a possibility, and talk of the IMF intervening. Make no mistake, Britain is on the ropes. If there ever was a right time for Scotland to walk out of this Union, this is surely it. The question is this: is Alex Salmond is up to the task of leading her out? Because if Whitehall tries to delay, prevent, annul, or nobble Scotland’s independence referendum - as it almost certainly will - there may well be a groundswell of popular democratic outrage, but if the moment is not seized, the opportunity will be missed altogether. 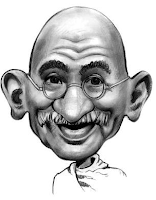 We all know Alex loves a curry, but is he up to being Scotland’s Gandhi? I don't share Salmond's political vision for Scotland's future. That being said, he's the best chance yet. He must, however, decouple Scotland from the international neoliberal agenda. If he fails to do that - then no - he's not our man. I agree, the best man for the job (so far), but the leader's political agenda will be irrelevant if he can't get it over the line. Once it's won, normal service will be resumed with the usual left, right, green political triangle, without every second politician dancing to our neighbour's tune. The problem is will Salmond continue to try for the referendum. It's my feeling that he could get it from the people if the parliament allowed it but I can't see him getting it through the parliament. A couple of my unionist pals have changed their minds and now say they'd vote yes in a referendum. My main concern is the amount of involvement with the EU. The Norwegian or Swiss approach would be more beneficial to us IMO. I agree. As things are, I can't see Salmond getting it over the line, but the UK general election result might change everything. And the LibDems and Greens seem to change opinion every time the weather vane twitches. And a year and a half is a long time in politics. And there's always events, dear girl, events... OK, I'll stop now. Agree on the Europe thing too. Once independence is won, I for one will want to see the EU kept at arm's length. It would be out of the frying pan, into the fire with a transfer of sovereignty from London to Brussels. What would be the point? That said, even if we decide to stay in Europe, it would be a vast improvement on the way things are. Norway seems to have a good arrangement, and has weathered the financial storm reasonably well. Like the US, the EU is a good idea gone bad. It just took a lot less time. I noticed a few of my unionist chums want the referendum held now too. They seem to think they've got a chance of slapping it down for a while. These are Scots. Incredible, isn't it? Every argument they propose for continued union comes down to a semi-religious zeal about Britain being right/big/legitimate/strong/ outward looking, Scotland wrong/small/petty/parochial/inward looking. It's trying to argue with a Jehovah's Witness. The best way I've seen to convert Scottish Unionists to the cause is to put them in the room with an ill-informed flag-waving Englishman ranting about Scottish subsidy junkies. Salmond is the only game in town and as such we need to get with his programme and strike whilst the iron is hot. No one else other than the greens are putting forward a credible package and are credible. If we bottle it this time we may not get a chance for decades and condem our nation to decades trampled under the weight of bankruptcy and austerity stripped of the rest of our resorces with our talented youngsters fleeing abroad in even greater numbers than they are now. Brown is mentaly unstable and has shown he is willing to torch Scotland, and he will. I'm sure that Salmond is capable of leading us through this, but we have to want him to - as a country. We're not there yet, Labour are so ingrained into the psyche of so many Scots and with that is ambivalence and in some cases antipathy towards the SNP. Electing Salmond FM was one step, but we're still not ready to let Salmond take the next step. As the UK continues to fail and when then Tories gain power at Westminster, I think there's a good chance that will change. But it has to come from the ground up. But my biggest criticm of him is that he has turned the SNP from movement ( albeit a small unsuccessful one) into a conventional, very conventional, political party. It is I believe objectively, and on near every count, more centralist that even New Labour . Its whipping system vicious, and previusly independent free thinking people disciplined into silence. Its selection procures tighly contolled, fixed id say in reality. I would not join - why bother, id be expelled within a few months! I think the SNP,s win in 2007 came at the wrong time, why ? Because people see the economy is in ruins and they normally turn against who ever is in charge. Labour are sitting back in Scotland and blaming the SNP for not coming up with plans to tackle the economy. I just feel had the SNP not been in power then the SNP would really make an impact in the 2010 elections and said look at the mess labour has made. I hope the SNP also do well in the UK elections but honestly i think we are looking at around 26% and 7 seats. This is not because people don't like the SNP, its the fear factor of the Conservatives getting in. The only way i can see Scotland winning independence is for the Conservatives to get fed up with the Scottish parliament and tell us, its either full independence or Westminster. In May 2007 I think it was essential Labour lost. What would it have said about Scotland had , our Parliament, if after their general mismanagemnt , third rate stewardship, graft, Iraq, Tident, and so much more they had still won? This by default meant the SNP had to win - and thank god it did, if only just. And of course it is a minority administion. And for the first time ever in Govermnent. Objectively it was always going to make mistakes, and mitakes it has made, many, But none to date fatal, indeed most minor, id say operational. (4)Dont tolerate governmental graft, a temptaion te world over for progressive movments in offfice - Sandi Thom is a warning. I genuinly belives blogs, and cyberpace in general, are our cretaive thinking space. The unique, new thing that might enable us to buck the historical trend, disprove your theoretically sound bleak analysis. And w are going to have to. The SNP DID win in 2007 Advanced Media Watch - get over it! Agree on the Labour addiction problem in Scotland, but I believe its persistence is a product of the withering Unionist press. As I see it, the two biggest things in our way are a hostile press and a fraudulent voting system which, when combined, will scupper this referendum with fear, uncertainty, doubt and good old fashioned deceit. Agreed, Salmond is best one to get independence over the line. What he has done so far is remarkable. I just wonder if he couldn’t do more. Why isn’t every Scot aware by now of the ignored 1950 petition with 2 million signatures, the McCrone Report and its content, the Willie McRae murder, the Scotland UN Committee’s efforts that led to our parliament, and the contents of the BBC Alba film Diomhair? The SNP are well funded now, so what’s stopping them getting the message out? Where’s the building of momentum towards a landslide of popular support and national pride? Maybe the SNP are saving this stuff for nearer the referendum, but why? Agreed. There needs to be a lot more happening outside the staid parliamentary scene, which should only be one aspect of it. This is the gist of what I was trying to explain in my reply to KBW above. It would be great to see Salmond trying to control a groundswell of popular outrage/clamour for independence, with peaceful demonstrations every month in towns across Scotland demanding a referendum, but it’s just not there. Most people you talk to are either passionate or indifferent, and I think Scotland’s unfree press is the critical factor. I don’t see fervent support for Labour or the Union, except from Labour Party drones. The SNP is just not getting its message out. Or it’s being drowned in the tidal wave of bilge coming from the pro-Labour press. However, I disagree with you on Salmond. I think he IS the man for the job, but he just didn’t expect to find himself in a minority government, and he’s making the best of what he has. This is a transitional phase anyway. I think Labour will be a spent force in Scotland after the next Holyrood election. A Tory PM in London a year before the election in Scotland will not be the ideal campaign platform for Labour in Scotland. Salmond is biding his time. Good advice. The SNP are like a good golfer whose game falls to pieces when he plays someone who’s crap – he doesn’t have to push himself and gets sloppy. You always play better against a better opponent. And have to agree with you on the power of blogs. Guido has clearly shown this week what they are capable of. What a week. I think I disagree with you about the SNP winning at the wrong time. It has given them time to establish their economic credentials in times of relative plenty. I think if the slump in the economy had hit first, they would never have got over the line – they would have been regarded as too much of a risk. A bit like how SNP support slumped after ’79. Not so sure about your guess about the number of Westminster seats they might win either. Swing/seat calculators are notoriously inaccurate and only work on a UK level. They rely on minority parties’ support being dissipated uselessly across the country, so that the Greens can win 15% of the vote and not get a single seat. They don’t account for local concentrations of support, or a well-timed groundswell of popular indignation at the futility of Scotland’s place in the Union. The momentum is with the SNP. Labour stand to lose a lot of seats in Scotland. I agree that the scenario you mention is possible, though - Cameron might indeed try a put-up-or-shut-up, all-or-nothing tactic. If he does, I think can it can only end in independence. "The next two years are going to be very interesting"